Flyleaf is a Christian, American hard rock band which formed in the Belton and Temple, Texas regions in 2002. 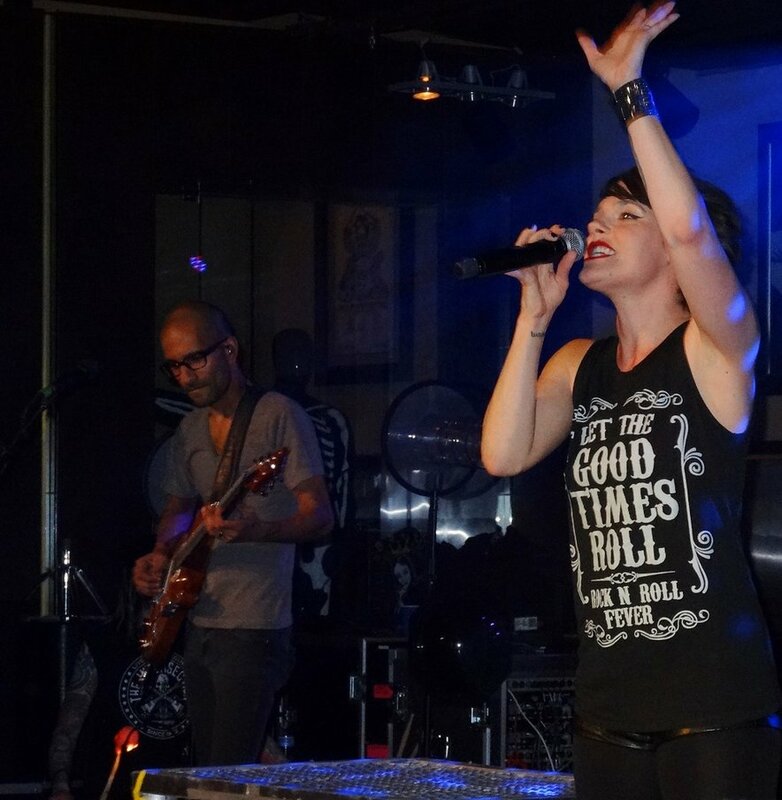 The band’s origin’s dates back to when Lacey Sturm decided to play dark, hard-edged songs she wrote as a teen to drummer James Culpepper. After playing together for a brief period, they decided to recruit guitarists Sameer Bhattacharya and Jared Hartmann. Former members of a local band who decided to call it quits. In 2002, bassist Pat Seals joined and the band formerly known as Passerby was born. As Passerby the band released 3 EP’s and played over 100 shows in Texas alone over the span of two years. In 2004, Passerby played a showcase for RCA Records in NYC, RCA passed on the band, but the President of Octone Records was very interested. The band waited for two days at a truck stop in their van anticipating a call from Octone Records. On the 7th of January 2004, the record label announced the band’s arrival to the label on their official website. In March 2004, Flyleaf travelled to Seattle to record an EP with Rick Parashar after which they toured with Skillet, Staind, 3 Doors Down and Breaking Benjamin to promote their self-titled EP. At the end of June 2004, the band officially changed their name to Flyleaf, due to another band already owning the rights to the name “Passerby”. In October 2004, the EP was released as “Flyleaf”, resulting in their first official single and video for the EP version of “Breathe Today”. In 2005 the band recorded their first full-length album with Howard Benson. On the 4th of October 2005 the record was released under “Flyleaf”. Appearances on the album include Dave Navarro of Jane’s Addiction and Ryan White of Resident Hero. The album produced four mainstream singles namely “I’m So Sick”, “Fully Alive”, “All Around Me” and “Sorrow”. In the summer of 2006, Flyleaf played the main stage at Family Values Tour 2006, later that year the band toured with Disturbed, Stone Sour and Nonpoint on the Music As A Weapon III Tour. An exclusive EP was sold at the tour Music As A Weapon EP which features an acoustic version of “Fully Alive” and three previously unreleased tracks. A portion of the funds made from selling the EP was donated to World Vision. In 2007, Flyleaf toured with Three Days Grace and through Australia during the Soundwave Festival. The band toured Europe with Stone Sour and Forever Never. 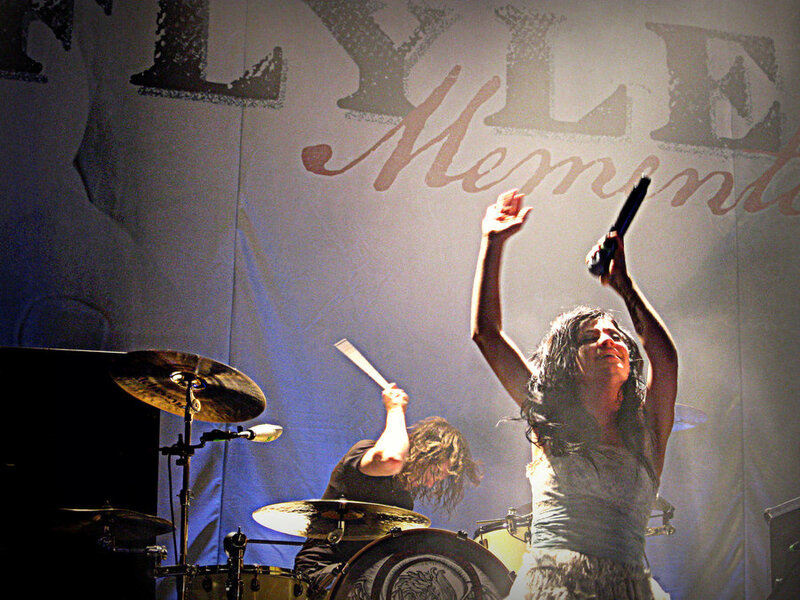 Flyleaf headlined the Justice & Mercy tour with Skillet and Dropping Daylight. A second leg of that tour featured Sick Puppies, Kill Hannah and Resident Hero. 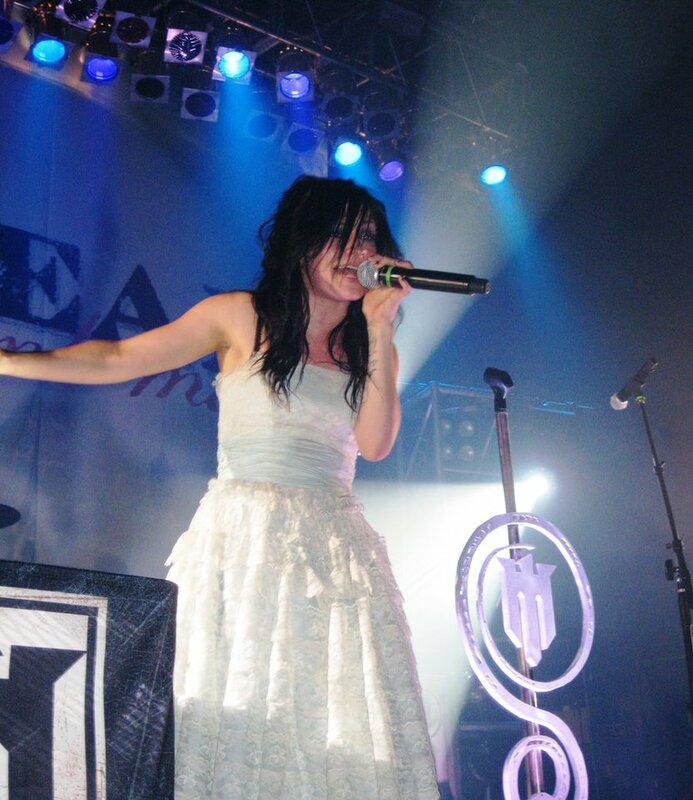 Flyleaf joined the Family Values tour in 2007. Flyleaf’s songs featured in many movies (Resident Evil: Extinction, The Nightmare Before Christmas) and video games (Sims 2, Rock Band, Guitar Hero). On the 30th of October, the band released a digital EP titled Much Like Falling EP. On the 26th of April 2008, the band released their fourth video “Sorrow” from their debut album MTV2. The band toured with Seether later that year, but the band had to cancel five shows due to complications concerning Lacey Sturm’s voice. When the band finished recording their second album , the band had to whittle down 30 songs to only 14. Flyleaf reunited with producer Howard Benson and Chris Lord-Alge mixed the album. The album titled “Memento Mori” was released on the 10th of November 2009. Flyleaf debuted two songs titled “Chasm” and “Circle” when they embarked on a small acoustic tour in Afghanistan for the United States Armed Forces. Their first single “Again” was published on the band’s MySpace page and released on iTunes. Starting in Seattle, Washington on the 28 September 2009 the band held VIP listening parties throughout the country, by inviting fans to be among the first to hear the band’s new material and to see brand new videos before they aired. The band teamed up with Eventful and fans were given the opportunity to demand that their city be included in the “Road to Memento Mori” using Eventful’s “Demand It!” service. Due to overwhelming demand over 10 events took place, where fans got the chance to see Lacey, Sameer and Jared perform. Flyleaf’s video for “Beautiful Bride” was shot in early August 2009, by Don Tyler. The video was featured on Yahoo! the day that Memento Mori came out. 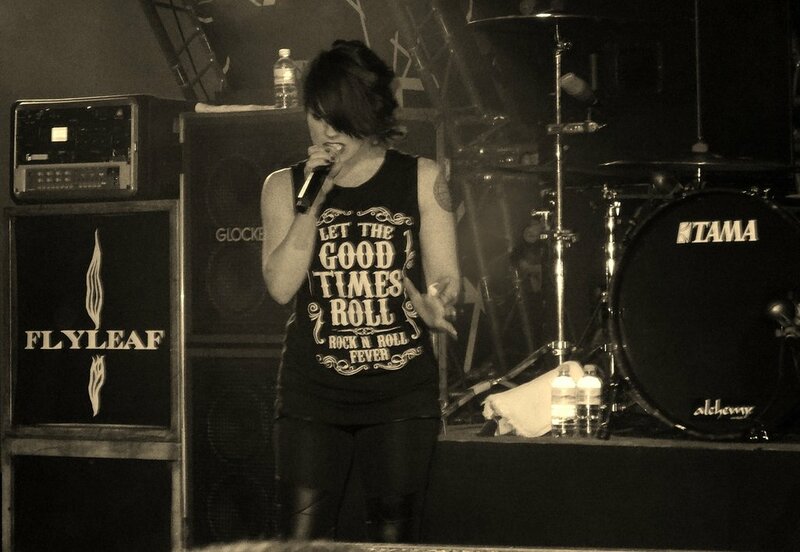 Flyleaf toured throughout the United States with Breaking Benjamin and Three Days Grace from January to March 2010. They embarked on a headlining tour called the “Unite & Fight” tour accompanied by 10 Years and Fair to Midland on the 28th of April 2010 to the 6th of June 2010. The band continued with the second leg of the tour from the 10th of September 2010 to the 23rd of October 2010 with Story of the Year and performed at various festivals the rest of the year. They released an animated music video for “Chasm” on the 22nd of September which was created by Giles Timms. At the end of the Unite & Fight tour in November, Lacy collaborated with Apocalyptica on the song/video “Broken Pieces” and partnered with Australian singer Orianthi on her song “Courage” The band released their next single “Arise” from Memento Mori. On the 15th of November 2010, Lacey announced to her fans that she and her husband Josh are expecting a baby boy in 2011. On the 7th of December 2010, Flyleaf released an EP titled “Remember To Live”. On the 22nd of January 2011, Jared announced that he and James were busy building a recording studio and preparing to record some demos for the new album. In February 2011, the band started pre-production on their next album at Treelady Studios in Pittsburgh, PA.
On the 1st of June 2012, Flyleaf announced on Twitter that the new allbum and single would be called “New Horizons”. The single premiered on radio on the 1st of August 2012 and was released on iTunes on the 21st of August 2012. On the 4th of September 2012, the band released a video for “New Horizons” on Fuse. Flyleaf released another single entitled “Call You Out” on the 25th of September 2012. On the 22nd of October 2012, the band announced that Lacey Sturm was leaving and she expressed that with the birth of her son Joshua “Jack” Sturm combined with the recent death of one of the band’s lead audio engineers(Rich Caldwell) that she finally knew the true meaning of “Memento Mori” (an object kept as a reminder of the inevitability of death). “New Horizons” was released on the 30th of October 2012. In a statement written by Pat Sears, it was announced that Kristen May (formerly of Vedera) was to be Lacey Sturm’s replacement. The band released a new single with Kristen on vocals on the 18th of June 2013 called “Something Better” featuring P.O.D. front man Sonny Sandoval. A new EP “Who We Are” was released on the 9th of July 2013. On the 29th of March 2014, Don Gilmore was announced as the producer for their upcoming album. On the 20th of May 2014 it was revealed that the band was now signed to Loud & Proud Records. “Set Me On Fire” , the lead single from the upcoming album “Between The Stars” premiered on the 1st of July through Revolver. The release date for the album is the 16th of September 2014. I discovered Flyleaf one day when I watched the video for “Broken Pieces”, I was extremely impressed by Lacey’s voice and the video that I decided to listen to her band’s material. I was captivated by Lacey’s voice and presence. Flyleaf has a unique sound and approach to the rock music genre. I was shocked by Lacey’s departure as I’m sure all the band’ s fans were. I recently watched the band’s latest video for “Set Me On Fire” and I really liked it. I started to read all the comments on the video and was surprised by the fans’ reactions to the new vocalist. Some fans had really nasty comments and I feel that this is very unfair. Lacey was talented, captivating and a true artist. Kristen is not Lacey, but that does not necessarily mean that fans have to automatically reject her. She didn’t cause Lacey to leave the band, she saw a great opportunity to advance in her career. This couldn’t have been an easy decision for Kristen, because she had some big boots to fill. Kristen is charismatic, talented and she deserves a fair chance from Flyleaf’s fans. 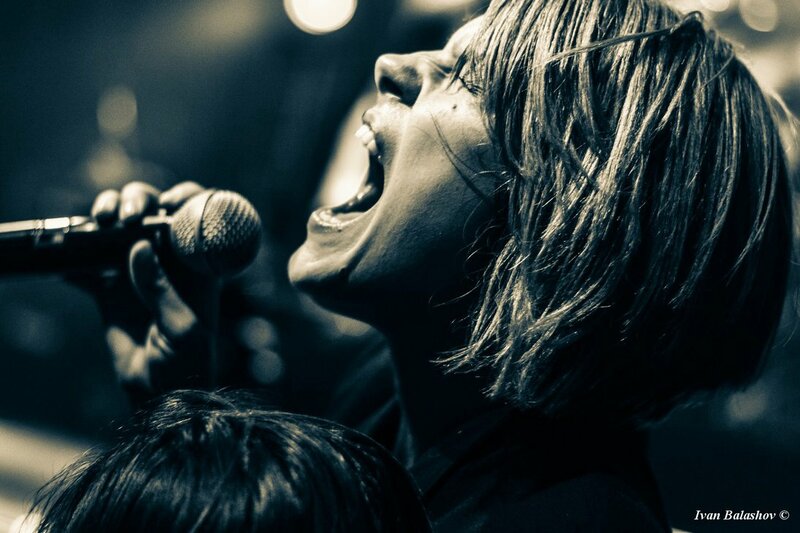 A vocalist is an important part of a band, but is by no means the only part of a band. After all, this is the music business, not politics. Keep an open mind and don’t judge too quickly. 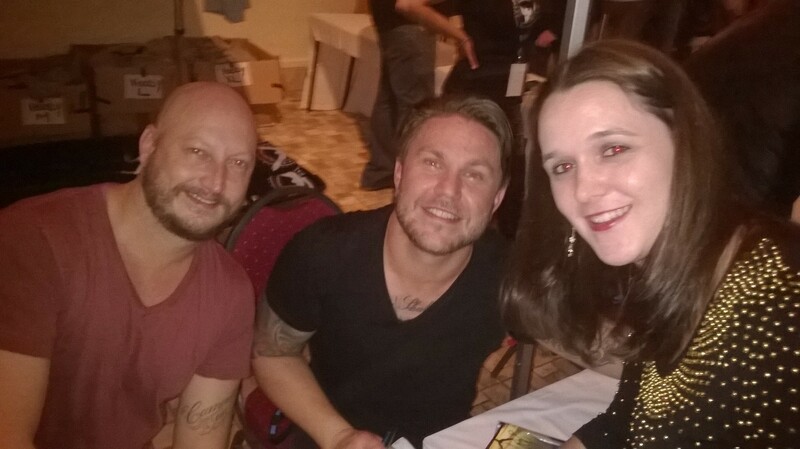 The band signing autographs at the merch stand. 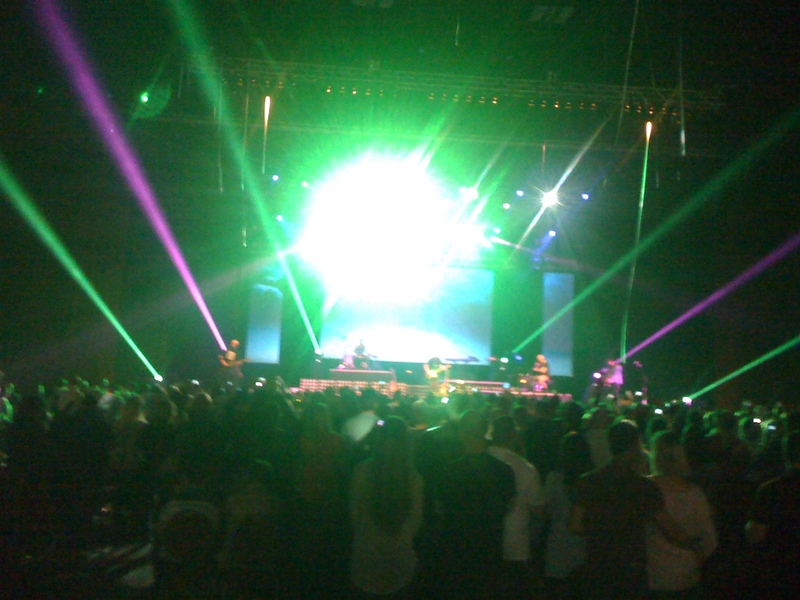 The stage, Grand West Arena. 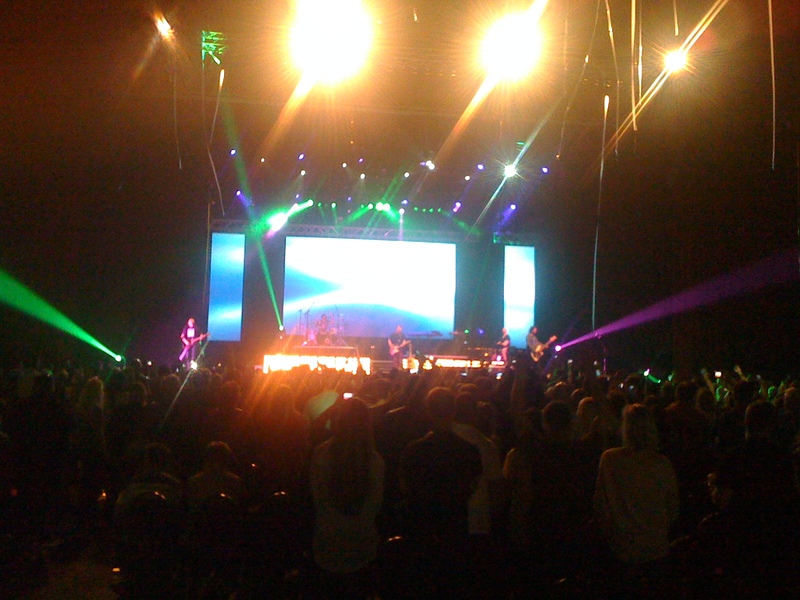 The stage at Grand West Arena. I haven’t been to a concert since I saw Nickelback last year in December and I was getting some serious concert withdrawal ;). 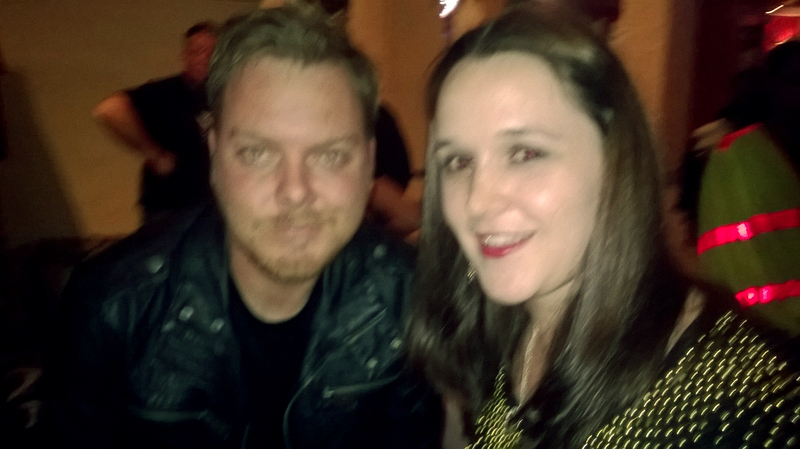 I was so happy when the time came to go watch Prime Circle for the first time. I’m really sad that I haven’t had the opportunity to see them sooner, but I decided to let bygones be bygones. 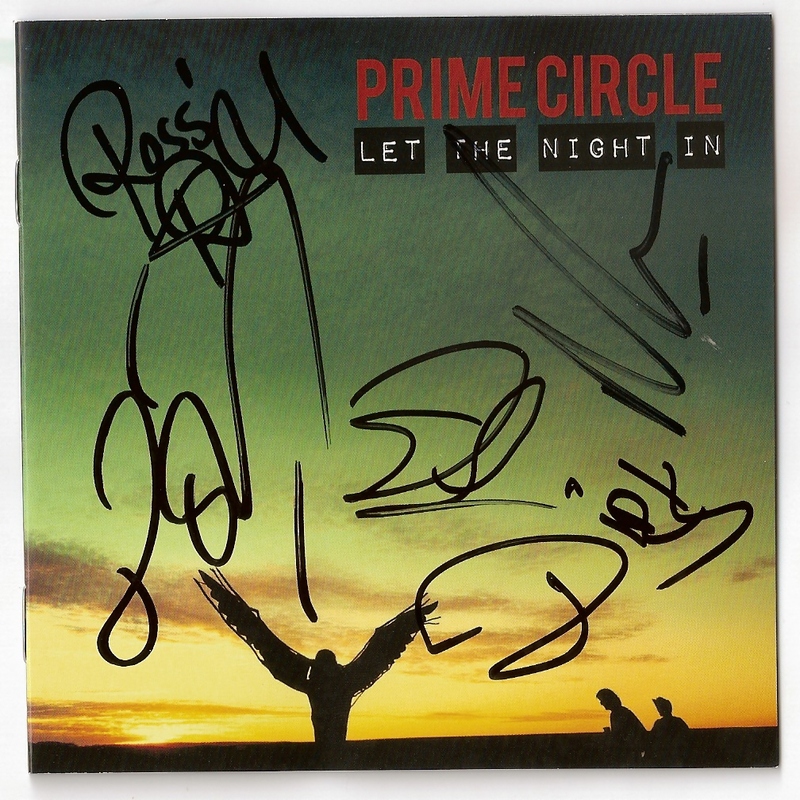 Prime Circle has become a South African staple over these past few years and they produce quality content time and again. I had listened to snippets of their latest album on iTunes and watched a few videos to psyche me up for the show. I normally like to know every single song that will be played at a concert, but everything happens for a reason, so I bought the album before the show. I entered the arena and was surprised to see that the Golden Circle featured seats, this gave me the impression that it will be a more chilled/acoustic type of show. Jesse Clegg performed as the support act and displayed some impressive guitar skills and entertained us with some acoustic songs. It was a pleasant surprise and really refreshing when Prime Circle opened their set straight after the support act. At previous concerts that I have attended the crowd had to wait 30-40 minutes for the main act to start playing. The introduction was amazing, the band opened up with some amazing graphics displayed on an enormous screen. The stage design was really impressive and on par with international acts. The band kicked off with the title track off their latest album “Let The Night In”. From the get-go my belief that this will be a chilled show was shattered, which I was delighted to discover. I speak under correction, but I believe the band treated us to each track on their latest album “Let The Night In”. The band combined that with some good old crowd-favourites like “Hello”, “As Long As I’m Here”, “Out of this Place”, “Breathing” etc. I’m listening to their latest album as I write this and I feel like these earphones are definitely not doing it for me right now, compared to how deafeningly loud the band was on Saturday. My ears were still ringing on Sunday!! I was dancing and singing in my seat the entire night, it took all my strength not to get up and go crazy. After a lengthy set, the band said their goodbyes and left the stage. The crowd inevitably wanted more and Ross Learmonth (vocalist) took to the stage alone to deliver an amazing rendition of their song “Batten Down The Hatches”, it was delivered with such sincerity that the crowd was captivated. The full band re-entered and things got REALLY loud from there on out. The band performed “She Always Gets What She Wants”, which Ross didn’t even really have to sing, because the crowd was doing it for him. They played “Consider Me”, Never Gonna Bring Us Down” and “I Am”. I’m so happy that I finally got to see the band in action and I can only hope it won’t be the last time! I was so lucky to get my album autographed by each band member and I was reluctant to ask for photos, so my fiance did it for me, I’m really happy he did. This image is the property of The Rock Riff. A blog post by Ottawa Citizen I thought The Rock Riff readers would appreciate.